Can someone please point me in the right direction for a better paint guide than what comes with the kit. I can't tell what any of the gear on the buklheads is supposed to be. And aren't the the bollards supposed to be white. While I am enjoying this build ( yes even the tiny PE parts ) I would like to know what color each part is ment to be. I am using the light grey superstructure with the nutural teak deck if that makes a difference. thanks. Do you have a specific date in mind? That narrows it down. Per your description, it's a post-war build. Like the Arizona I bend to what the client wants .I think it looks kind of Historic and yes pristine in Haze grey and the Deck Tan or white oak . Most of the fiddly bits will match or be painted to match their job . Like the black Stack tops , Red fire gear and Very light tan for fire hoses . If the hoses are uncovered then the ends are brightly polished brass . Any " Carley " floats ( the rectangular ones would be a dark aircraft grey to represent painted canvas over Kapok . ) I do know the U.S.S. Rochester's Boats were painted deck grey on the upper surfaces . The Admiral's barge , now , had a lot of natural wood " Bright-work "
When I saw the " Mo" she was just coming out of Mothballs in Bremerton prior to her 1981 refit ! No Boats and smaller armament covered . If you intend to do her in her museum condition--a valid choice--with natural decks and haze grey verticals, that will be fine. You'll still need a dark grey for the steel decks and horizontals. As for all the "bits" on the bulkheads, that depends upon which "bit" it is. Racks of fire hoses will be a whitish grey color. But, fire fighting reels will be red. Cordage reels will be bulkhead color. Note that the flight deck area is a very dark charcoal grey, significantly darker than deck grey. Non-skid areas on metal decks are a similar color, too. "Bollards" are shore based moorings, and are in several colors. On board ships, they are called "bitts" and are nearly uniformly hull color (although, they are sometimes in deck color)--you need reference photos. From a quick dash through google images, the museum at Pearl has black bollards on the dock. Most of the deck items are in haze grey. Note that most of the close-up museum photos are showing a silver-grey wood tone for the deck (very much like a wooden privacy fence i nthe US), and not the very tan raw-wood look. Without a photo or diagram of the area in question, it's hard to answer what "bits" are there, and whot color they ought be. USN loves its Haze Grey (and now the pre-catalysed acriling formulations of same) and will apply it to many things. Usually only excepting brone, brass, gunmetal, or natural materials (and even those, too--like cork, wood, canvass and the like). Asking us what a doodad is here (with a photo or diagram) can help answer the question. CapnMac82 , Thank you and everyone else for your replies. wish I knew what all the do dads were called. I even had bollards wrong. See what happens when an armor guy tries to build a ship! LOL. Other kits have color call outs in the instructions but all this has is the 3 view . Not what I consider very informative. CapnMac, You really have a lot of great color info, but you & tanker were sailors. My brother was with the Missouri at the surrender & took the Missouri out from Pearl Harbor. He was on the Indiana. I used to bug him about colors all the time. I guess they varied a lot . We were on the Mo. In 1978 Tank, with my best friend who was a sailor too . He ran a landing craft at Omaha Beach on the first wave & was on the N.J. in Korea. I had a lot of first hand info for models, but I do forget a lot now. I do know my brother talked about the deck apes holystoneing the deck, so I guess they were natural a lot. I did a tour of the Iowa a couple years ago with a friend of mine who was a former gunners mate. One thing that he pointed out to me was for external ready ammo lockers on deck have their tops painted white as a heat countermeasure. I've never noticed this in WWII era photos, but I’ve seen it a lot on Cold War and current era USN ships. "Armor guys have it eeeeaaassy"
The subjects were made by the thousands. Walk-arounds and color guides are abundant. Custom paint kits are even available. For ships, not so much. The kit manufacturers are not much help, either. Turn out a Hurricane, then rebox it as arazorback T-bolt (and a Spit) with not so much as a blush. Then, the subjects are trickier, too. Only 4 7/8's Iowas were ever built. The four that were completed actually have significant differences between them. So, you spend a lot of time look at refernce photos. To where you can spot differences even at small scale and great distance. Which can give a jaundiced eye. Kind of like back in he dark ages when there was only one SdKfz251 kit (well two if you found a copy of the Nitto with Nebewerfer rocketen). If you wanted a variant, you had to go pour over obscure books in libraries and send mail order for obscure pubs, just to know what to scratch out of sheet styrene. RLM Dunklegelb? Huh, there was "desert tan," if you had a well-equipped LHS. Weathering kits? Er, have you tried the Arts & Crafts store? That's where ships are right now. Riht at the ede of the explosion of armor kits in the 80s--but only sort of. Mind, I'll admit my biases. I used to wake up to the XO's lists of "Must Dos" and would have to go find the Chief and the LPO and sort out wish of the "deck apes" could be trusted to which tasks, and with what level of supervision. Rust on bulkheads; paint peelin from overheads, paint splatters on the decks; how many sparkies it would take to "safe" the commo gear on the mast so that could be all painted (and which of the sailors could be trusted to not fall off the mast; nor dribble paint on people below). Usually while simultaneously handling al lthe rest of the division or department paperwork, studies, message traffic and all. I meant to add earlier that the Trumpeter color instructions aren't worth lining a bird cage with. In addition to making up the names of colors, they also show weird stuff in the color three views, mainly color variations that were not there. Since you have a wood deck, you might as well leave it wood colored, otherwise what's the point. 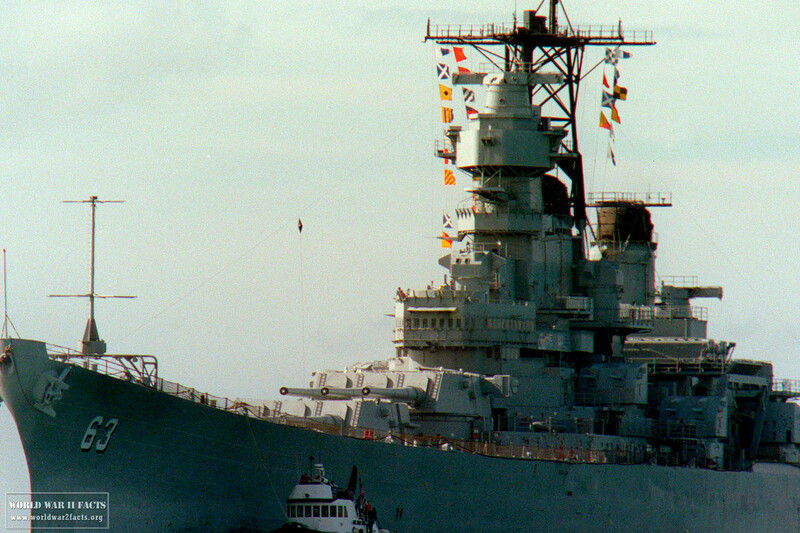 At the surrender, BB-63s decks were stained wood or painted steel. A color named Deck Blue. The verticals were Navy Blue from the waterline to a horizontal line level with the lowest point of the main deck. Everything above that was Haze Gray. I don't think the deck fittings were picked out much with different colors. Prior to that except maybe while being fitted out, her decks were always stained. I've read that somewhere between the far east and home her decks were returned to natural wood. Photos of her in I think October 1945 in the Panama Canal show wood decks while she still wears camouflage. There's at least one picture of her in 1947 where she looks to be overall Gray, although she still has the small wartime numbers. In 1950 she ran aground in Chessie Bay. Must have been a few careers ended that day. But a lot of photos were taken and she was all over Haze Gray with natural decks. Your challenge, if you care, is that in the period 1947-1950 a fair amount of detail must have changed. I can't say what as I don't know a lot about BBs after 12/7/41, but the usual suspects are AAA, radar and comm stuff, gun directors and a peacetime boat fit. This is a good source if you haven't seen it yet. I was just aboard Missouri a month ago on a trip to Hawaii, and I've been aboard Wisconsin and slept aboard New Jersey. You know what would be an interesting idea for some intrepid 3D printer? The museum fittings. Like the canopies, some folding chairs, the display boards, the on-shore building that leads up to the gang plank, etc. Add a current paint chart and I bet they'd sell in 1/200 or 1/350. You all have been very helpful, but one last item. The area under the anchor chains on deck. Pictures show it to be a darker color. I can't tell if it's black , dark grey or navy blue. Anyone have an input on this? The color will depend upon the era time frame that you are representing. During WWII the camouflage measures used specified what colors were to be used on non wood horizontal surfaces according to the surrounding area. On many of the “Measures”, that was Deck Blue, but there were some schemes with a disruptive pattern on the decks as well. On a plain overall Haze Gray scheme, steel decks are usually Deck Gray. The area under the anchor chains on deck. Pictures show it to be a darker color. I can't tell if it's black , dark grey or navy blue. Anyone have an input on this? That's "non skid" and was mixed to formula. The WWII stuff resembles medium-weathed asphalt. From my old Bluejacket Manuals, I want to remember there was a tar component, along with the sand and cork that went in. Post war non-skid had rubber granules and sharp silica bits set into a liquid rubber/latex base. By the 60s it came in buckets and applied like asphalt driveway patching. In the recent era, it's become glass sand in an epoxy base. Colors range from arounf Medium Ghost Grey to Panzergrau to Nato Black--and that varied with how close you were to the stuff, too (even before coping with Sacle Effect). General rule of thumb is to be not quite as dark as aircraft landing decks (yet another color thread o_O), but darker than Deck Grey. For overall Sea/Navy blue ships (WWII era) a medium grey seems to scan most apt. Now, this might sound like way too much work. And, the aftermarket community has answered that, a bit. There are decals for anti-skid for some kits in some scales. I've seen those work out nicely. So do you think that " flat Rubber " will work? Or go with something a little more gray? The old "square bottle" Rubber was a decent match, at large scale. If you have it masked off, and had a stiff, stumpy, brush you could "stipple" it with grey(s) to good effect. If that looks a bit busy, a varied wash with black and/or umber will get you there. Yeeballing google images, the foredeck material comes off as black to charcoal, but that's invariably in full sunlight with the camera rendering the deck nearly the same shade as the bulwarks. From standing-on distance, none of these materials were anywhere near as dark as my shoes/boots. Closest thing would be brand-new flightdeck material--and even that was still a couple shaded lighter. 2¢, spend it as you will. So I chose to go with NATO Black. Looks like black with a touch of grey. Looks good but will reserve my final decision once the paint has dried for a day or so. I know it's a ways off, but what about the rigging? where can I find something that shows the rigging with enough detail to follow? thanks again to all that have contributed information. Just on memory, the Iowas did not have any standing rigging at all. There may hae been some wire antennae between the masts, but, that's going to vary upon the "when" of the ship, too. There would be either three (or four--need to look at the plans) signal halyards. Those halyards are 3/4" diameter, which is 0.00375" (0.095mm) which is about 40 gauge (0.00314") wire. About 20 denier or 6/aught fly tying thread. So, it's down to your desire, eye ball, as to whether you want to chase those. Good on you if you do--no crime if you don't. The actual lines where originally white cotton, which changed to a white-ish nylon, and is probably mantled yacht braid now. Color would be an ashy-white. Thinner always looks better on ship models. If you are inclined to rivet count, there's a lanyard to the top of the foremast to fly the comissioning pennant. There's another halyard up the foremast for Battle Colors; and a similar one on the mizzen. The point is that other than several lower frequency antennas that are necessarily quite long and therefore are run between high points, the rest of it is pretty much for flag hoists. As GMorrison points out, we nautical types use "rigging" generally to mean the lines which support masts, and funnels, in some eras. Examining the photo above, there are four "signals" flying. One of those will be the four flags of the ship's radio call sign--NCBL. At the far left there's actually a long signal running, the second hoist of which is just peeking out. Signal flags are fit with a toggle at the top, and a rope "fly" 60" long at the bottom. 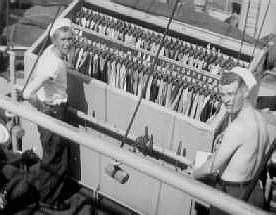 Those get fitted to lines which pass over a pulley (the nautical term is "block") so that the array of flags can be raised or lowered to need. There's one of these on each side. Note the large flag on the foremast. A battleship uses Size 1 flags (but typically carries a set of 2, 3, & 4 for national colors). The "Sunday Ensign" will be a Number one, 20' tall and 38' long. Well that helps some. It's a shame that Trumpeter doesn't include placement drawings for this. The Fletcher I did for my father-in-law had all that in the instructions. where did you find these pictures?